Mayan Civilisation dominated the Mesoamerican region for thousands of years and particularly made impressive advances during the Classic Period of the civilisation extending from 250AD to 900AD. During this period, the Mayans produced impressive art and architecture and their urban centres had thriving populations. Mayan architecture was particularly impressive and the ruins of these urban centres still have a lot of grand Mayan buildings of various sorts. These Mayan buildings depict the grandeur of the bygone days of the Mayan civilisation. The history of Mayan buildings goes back to the Pre-Classic Period which extended from 2000BC to 250AD. Not much is known about the initial phases of the period but during the Terminal Pre-Classic Period, around 400-300BC, Mayans had developed their urban centres and Mayan buildings were beginning to be constructed. It was during the same period that they started building large temples and pyramids for religious purposes. During the Classic Period, between 250AD and 900AD, they built upon these initial developments and created some of the finest examples of Mayan building and architecture. After 900AD, the collapse of the civilisations began and hardly any noteworthy Mayan buildings were built. Mayans used a variety of local and imported construction materials for Mayan buildings. The Most common construction material was the stone found locally in the quarries outside the cities. Limestone was particularly common since it was found in plentiful amounts throughout most of the Mayan settlements. The stone extracted from the quarries was further refined by chipping and flaking it to a flat surface. Other than limestone, mortar was another common material for Mayan buildings. Mortar was created by burning the limestone with wood through a special process. Mortar was also used to coat the floors and outside of the buildings. Stucco was used for decoration purposes although it deteriorated quickly due to humid weather conditions. Mayan buildings included some of the finest palaces in the region which were large and elaborately decorated. They usually built multiple palaces at the centre of the city and the elite of the city resided there. The acropolis was the large royal palace which had many chambers on different levels. Palaces other than the royal palace usually had just a single story and consisted of small chambers along with a central courtyard which was an integral feature of all palaces. These palaces also had specific places reserved as burial sites for their inhabitants and various ancient tombs have been discovered from the excavated palaces. A special kind of Mayan buildings located in the central and southern Maya lowlands has been classified as E-Group. These Mayan buildings consist of a stepped pyramid as a central structure along with quadrilateral plaza or platform. On the eastern side of the plaza in the E-Group, there is a raised by elongated structure running north-south. Often there are also two other subsidiary structures on the north and south sides of the plaza. 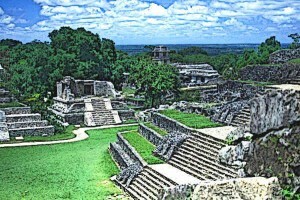 The main structure usually has terraces with several levels and a stairway leading form the plaza. Due to their alignment with the movement of the celestial objects, these structures have been called observatories, although the exact purpose remains unknown so far. Perhaps the most important Mayan buildings were their pyramids and temples which were constructed specifically for religious reasons. Mayans were among the first people to construct stepped pyramids which usually had flat tops where they made their religious temples. Some of the pyramids did not have flat tops and were not supposed to be touched, being considered sacred. The temples at the top of these Mayans pyramids were reserved for religious ceremonies and rituals, sometimes including the ritual of human sacrifice. Temples and pyramids were among those Mayan buildings which were elaborately decorated and are among the finest examples of Mayan architecture. Among the most important Mayan buildings we can also include their observatories built for the collection of astronomical data. These observatories were used to map out the phases of the celestial objects, in particular the Moon and Venus. It was also here that detailed eclipse tables were created and relevant data collected. One of the largest such observatory is located at Chichen Itza and is known as El Caracol. This structure is dated to around 906AD form the Late Classic Period of the Mayans. Various other observatories have also been found in other Mayan cities. Another important kind of Mayan building was the Mayan ball court. Ball games were the most important game in Maya and had a ritual significance. For this purpose, ball courts were constructed throughout the Mayan civilisation and some of them were built on quite a grand scale. For instance, in just the single Mayan site of Chichen Itza, 13 ball courts have been identified with the largest one, known as the Great Ball Court, measuring 168 by 70 meters. This particular ball court has vertical sides, although some previous ball courts also have sloped sides. The Mayans built various kinds of platforms, including elevated platforms with monumental stairway and ceremonial platforms. The elevated platforms were accompanied with a central building facing the stairs and two lateral structures facing each other on both sides of the platform. These platforms were used for various kinds of enthronement rituals. Other kinds of platforms include limestone platforms with less than four meters in height. These platforms were used for common public ceremonies and religious rites and consisted of carved figures and altars. The Mayan civilisation flourished for over three thousand years with most of the advancements made during the Classic Period extending from 250AD to 900AD. During this time, the Mayans built a wide range of impressive Mayan buildings including various temples and pyramids, palaces, ball courts, and platforms of a variety of sorts. They also built observatories to record the movements of the celestial objects and collect the data for religious purposes. Various Mayan sites throughout the Mesoamerican region provide testimony to the grandeur of Mayan buildings and architecture.